The ISO 10873 describes methods for testing the adhesion and consistency of denture adhesives. The denture adhesive it put between two plates consist of polymethylmethacrylate and the specimens close at a crosshead speed of 5 mm / min. The sample is load with 9.8 N for 30 s. The test specimens are pulled apart and the max. Force is measured. The adhesive strength is calculated as force per unit area and must above 50 kPa. This investigation is carried out fully automatic and calculated from the maximum tensile adhesion in kPa. 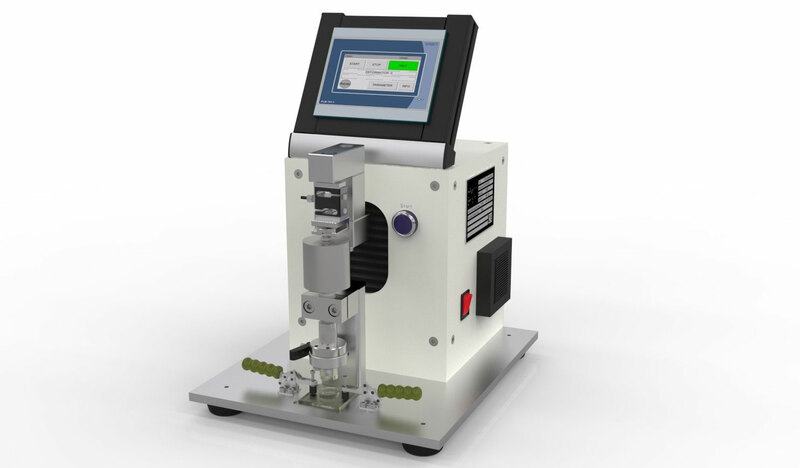 The test can be selected with the keypad for the adhesive type: Class 1: powder, Class 2: cream.Furthermore, the cross-head speed and load period can be adjusted. The test force is generated by a weight. We are also produce different weights for different test loads for you.